For those who don’t know me yet, I recently joined IWCO Direct as a senior customer engagement manager. A rapidly growing area within IWCO Direct is our front-end strategy capabilities as part of the Proprietary Intelligence model, and my role includes working with our clients to build out segmentation, messaging and creative strategies to improve the effectiveness of their campaigns. Prior to joining IWCO Direct, I had gained valuable experience in direct mail working for Periscope, the largest independent marketing and advertising agency in the Midwest, as well as Griffin International Companies and Golf Galaxy. But it was nothing like living it day-to-day at IWCO Direct – it’s like earning an undergraduate degree versus a highly rigorous master’s program. Direct mail was a particularly important part of the marketing mix at Golf Galaxy, both to advertise new products, services and promotions to our customers, but also in terms of partnerships with our vendors. 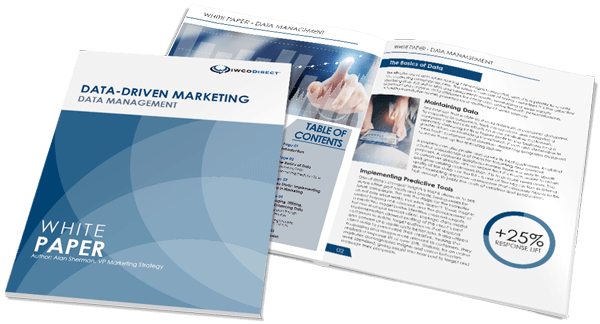 We had a sophisticated customer loyalty program, including the use of segmented strategies based on customer profiles and modeling, triggered programs based on purchase behaviors, etc. At the time, we were just scratching the surface in terms of the possibilities for tailored messaging to maximize the response within our audience. I’ve been floored by the recent advancements in technology that have made extremely specific segmentation and creative versioning so much more manageable from a process standpoint as well as cost perspective. This allows us to be much more creative and thoughtful in how we slice and dice our messaging. In my experience, I’ve come across more than a few folks who think of direct mail as slow or outdated – that it doesn’t have the same sizzle as TV, social media or experiential marketing. That sort of thinking baffles me as I learn more about the proven results of direct mail. Just because direct mail isn’t “new” doesn’t mean that it isn’t effective. While there is a place for “buzz” in the marketing mix, there will always be the need for impact – hard results. Direct mail, especially when done well, with thoughtful segmentation and creative strategies, garners ROMI that can’t be ignored. The thing that excites me most about direct mail is that it can be laser-targeted and is very measurable. By nature, it provides a constant feedback loop to let you know what’s working and what’s not, whereas so many other channels can leave you wondering what specifically caused a success or failure. And it’s so fantastic to be a part of a company that understands the value of being an end-to-end partner to our clients. We are the furthest thing from a “direct mail print shop.” We build strategies that gain clients the most return for their marketing investment, design creative that will break through in the mailbox, work with the Postal Service to ensure campaigns are more timely and cost effective, analyze the results and continuously refine. It’s a truly phenomenal team whose depth and range of experience is a huge asset to the brands we support, and I’m thrilled to be a part of it.